Underwater view of Hawksbill Turtle (Eretmochelys imbricata) swimming above coral reef near Bloody Bay Wall. Photographed April 26, 2007 with a Canon EOS-1Ds camera and 16-35mm f/2.8 lens with a Seacam underwater housing. Exposure 1/125 second at f/8. This entry was posted on Thursday, April 26th, 2007 at 6:20 pm. 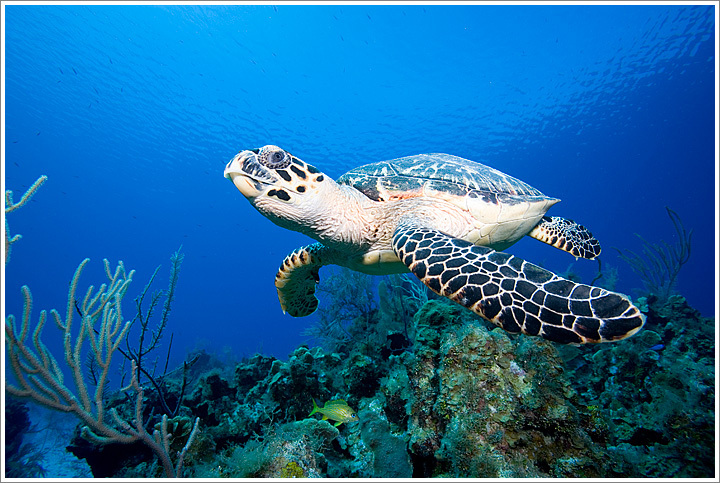 It is filed under Underwater and tagged with Caribbean, Cayman Islands, Caymans, Endangered Species, Underwater. You can follow any responses to this entry through the RSS 2.0 feed.